Eventually Caesar’s and Pompey’s forces meet – fortunes of war swing each way until Pompey relies too heavily on his cavalry, who are routed by Caesar’s infantry. Pompey escapes to Egypt where he is quickly put to death by the henchmen of King Ptomley XIII the boy king, who is fighting his own battle for the Egyptian throne against his sister Cleopatra. As consul of Rome, Caesar offers to mediate between the two sides, but is besieged by Ptomley’s forces in one quarter of the city, starting off the Alexandrian War. Also in this volume are descriptions of the subsequent Alexandrian War, and the mopping up of the remaining Pompeian forces (the African War and the Spanish War), continuing the thread of events; at first believed to be also written by Caesar but soon attributed to other, anonymous authors. No mention of Caesar dallying with Cleopatra though. Six months after defeating the Pompeians in Spain, Caesar is assassinated on the Ides of March 44BC. “Therefore I earnestly ask you to join with me now in taking over the government of Rome; if timidity makes you shrink from the task I shall not trouble you – I shall govern by myself. 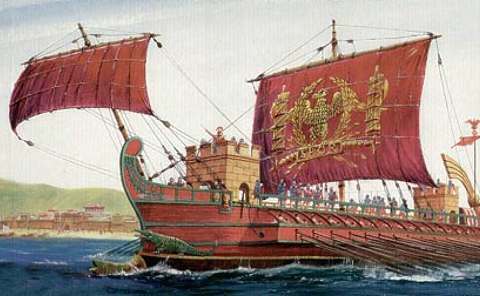 Various types of warships employed by the Romans and others. A trireme has three banks of oars on each side, each oar rowed by a single man. Used by the Phonecians, Greeks and Romans, they were superceded by the heavier quadriremes and quinqueremes. 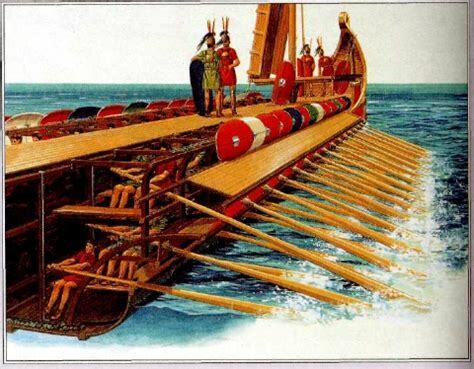 A quadrireme had, as the name suggests, four rows of oars, possibly with two men per oar; while the quinquereme had three banks of oars with the top two manned by two oarsmen per oar, and the lower bank with one man per oar, a total of 300 oarsmen and also capable of carrying up to 120 marines. Just so you don’t hop on the wrong one to take you across Sydney Harbour or the Firth of Forth. Personal rating: Not as exciting as the Gallic Wars, until the final confrontation and the subsequent events in Egypt. It was also difficult to keep track of who was on who’s side. Lets call it a 4. Black cats and Butlers, by Janine Beacham: Plucky young heroine Rose and her overly dramatic proto-Goth friend Emily discover a world of graverobbers, magicians, duelling butlers, secret societies and mystical cats in an alternate version of York. First in a series for readers 10-12, this was a cracking good read but how I wish it had been written for an older audience, fleshed out with more detail – it was all over far too quickly. Next : Sallust’s two surviving works, The Jugurthine War and The Conspiracy of Catiline. Will he support Cicero’s versions of events regarding Catiline?